A Cultural Tour of Cloughaneely. irelandphoto.com >> local history >> A Cultural Tour of Cloughaneely. 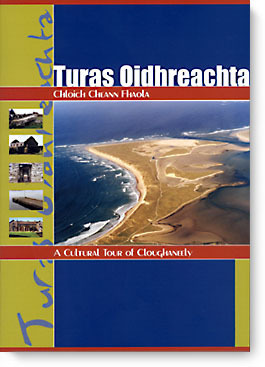 A companion to "Aspects of Our Rich Inheritance", this full-colour brochure takes you on a "turas", or tour, of eighteen different heritage, cultural, and archaeological sites in our Donegal parish of Cloughaneely, each with a photograph and account of the history behind it. A4 (210x297mm), 12 pages. Full colour throughout. In English and Irish. Published May 2000.
irelandphoto visitors may obtain their home-delivered copy of this publication for the special price of €6-99 (IR £5-50 inc. P+P). Please print your return mailing address clearly including country and zip or post code, and quote reference: "web".